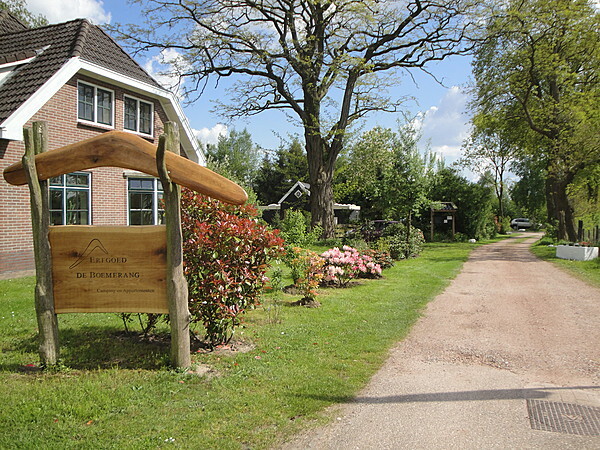 At the foot of the 'Hondsrug', in the beautiful village of Meppen in the province of Drenthe, you'll find campsite the Boemerang. By its location, on the edge of the village, the site is excellent for peace seekers and lovers of nature. On the grounds there is a small pool with beautiful wild flowers where frogs are croaking at night. A number of pitches are lying around this pool. The campsite is managed environment-friendly, with respect for humans, animals and the environment. Sometimes you can buy homemade products, like free-range eggs or unsprayed strawberries. You may gather your own herbs.The grounds are rich in birds and the atmosphere is of rural charm. Cars are parked at a separate parking place. There is a fridge and a washing machine available for guests. You may bring your dog. There are special walking tours set out from the campsite and there are excisting bicycle tours. A comprehensive information folder is available at the owners. Meppen is an old village with nicely renovated old Saxon farms. This is a nice area for hiking and biking. In the surrounding of the village you'll find beautiful nature and pitoresque villages. You can visit megalithic graves, animal park Emmen, the museumvillage Orvelte or the memorial center Kamp Westerbork.